Two weeks ago we took a bit of a field trip that was out of this world, you might say. We met Commander Chris Hadfield, a Canadian Astronaut! Perhaps you were like us and following Commander Hadfield while he was in charge of the International Space station last year? This was the time I had first signed up for Twitter and he was a very frequent tweeter, sharing his unique photographs that he had taken looking down on the earth. It was fun to see places we’ve been from a new perspective. 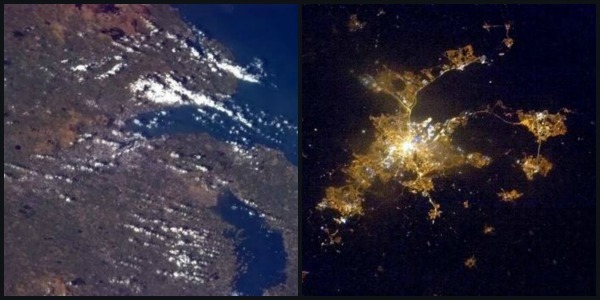 Here are two of his photos of the Belfast, Northern Ireland area. Commander Hadfield kept us entertained as well, getting out his guitar and serenading us. He’s most known for his rendition of David Bowie’s Space Oddity. After a lifetime of reaching for the stars, he retired from NASA last year, but that has not slowed him down. He’s written a book, “An Astronaut’s Guide To Life On Earth“. I found out about this book just after Christmas and sent myself a little New year’s gift from Amazon! I haven’t had a lot of time to read, but I’ve been leisurely making my way through his book with pleasure. I found out that he was in the UK doing book signings but there wasn’t anything scheduled for Northern Ireland. We’d already missed a Dublin date, and there was another one coming up during a science fair. I was still hoping he’d make his way up North of the border. As things happened, he did indeed have two Northern Ireland book signings come up on his schedule, but alas, they were the only two days of this entire year that were impossible for me to take the kids as I was going to be in London for a workshop on the future of research in premature babies. It was one thing if I didn’t get to see him, but I REALLY wanted the children to have the opportunity to meet such an inspirational character, and they’d likely never get the chance again. Tristan is really loving science at the moment, so this would be perfect. So it was that at 1:00 am I finally convinced Phil to get up and go to Dublin with us. 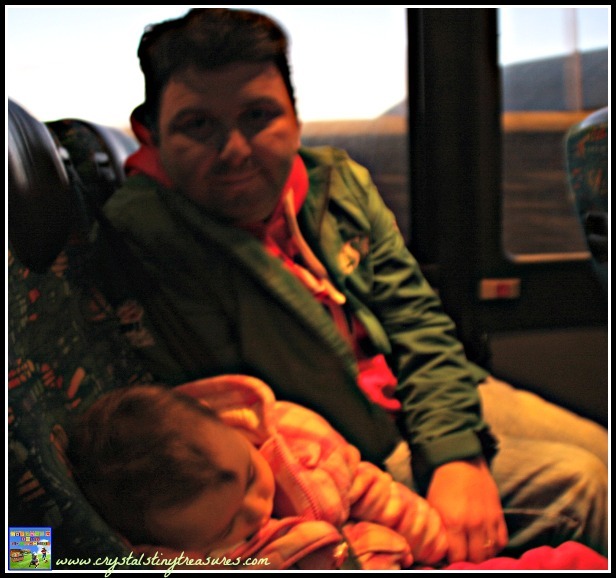 In order for me to go with the kids we’d still have needed him to drive us to the bus depot in Belfast as the buses and trains don’t run that early in the morning. At 3:30 am I crawled out of bed and started to gather up snacks and hats. We all left the house at 4:30 am. The children didn’t have a clue what was going on, as we were keeping it as a surprise for them. 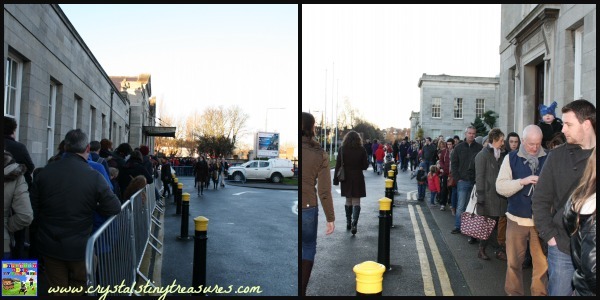 After three modes of transportation and 4.5 hours, we were finally standing in line outside the RDS. It was chilly, but at least it was dry and sunny. The kids still didn’t know what we were up to, and at this point they didn’t want to know, they enjoyed the element of suspense! Once we were finally in the building two hours later we told the kids who we were waiting patiently to see, and they were quite excited about it. So was I, as we’d taken a wrong turn and had walked the wrong way that morning and were in line much later than planned. I wasn’t sure we would make it in. We still had some waiting in line to do, but this time things went much swifter and we were soon in the Member’s library. It was interesting to watch Commander Hadfield in action; he really knows a lot about PR, and he genuinely appears to enjoy it! We couldn’t schmooze as much as earlier folks could as the signing was only meant to be for one hour. By this time he’d been signing for about 2 hours already. He stopped now and again to nibble on a bun or have a sip of tea, but he kept a smile on his face. It was very well organised. There were people there who made sure your book was open to the correct page, and there were also people there to take photos of you with your own cameras or mobile/cell phones. This was super because it meant we could all get our photo with Commander Hadfield at the same time. I was just expecting one or two pictures, but they really went to town and took a lot. We made sure to wear maple leaf pins and Canadian clothing. Phil wore his Canadian toque and his new Saskatchewan Roughrider’s jacket my Uncle and Aunt brought over for him recently. 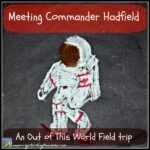 Commander Hadfield even commented on them! 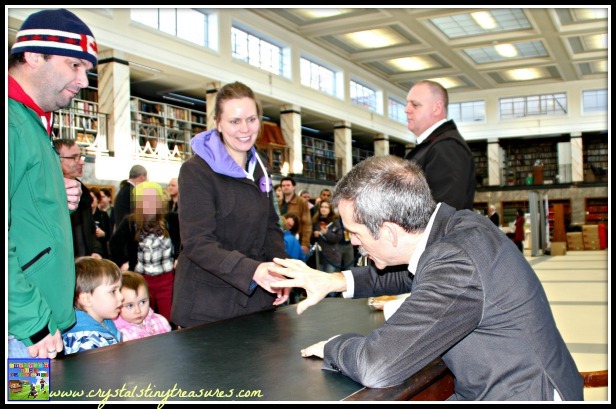 Finally it was our turn to go up and meet Commander Hadfield. Although I knew he was in a hurry, I did ask if he could kindly sign my book to Tristan and Kallista to make it more special to them and he happily obliged. 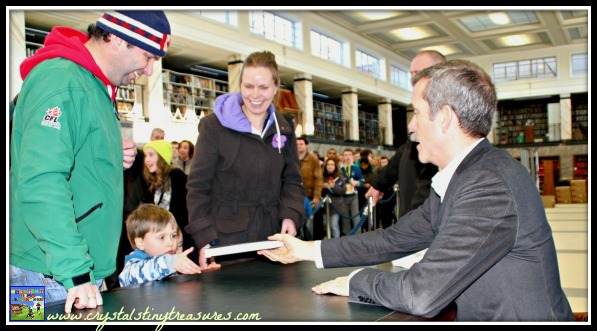 He made sure that he handed the book back directly to Tristan so that they could have their photo taken during the exchange. Then he waved and tried to get Kallista to talk, but our children were their usual shy selves, but I do think he may have received a grin from them! In total, over 700 people had shown up for the signing that morning, and I do know that after a certain time they stopped people joining the line. I was worried because three times security came past us counting and pointing to spot just 4 in front us. But we made it, and the kids will have a story to tell their children someday. In fact, the 60 minute book signing was extended to two hours to accommodate as many people as possible. We spent the afternoon in Dublin’s city centre having lunch and wandering around Grafton Street and St. Stephen’s Green park. We watched the birds and appreciated the sculptures. It’s been 8 years since I was last in Dublin, and I’d forgotten just how busy and expensive it is! I do love the old Georgian architecture of it, and the buzz of the pedestrians. There were of course street entertainers along the way though I didn’t photograph them as I had spent my funds already. It didn’t take long for the time to pass and we had to head back to the bus depot and begin our return journey back home.. By the time we arrived back at home it was 8:30 and time for a quick bite to eat and off to bed. Tristan says that he’s written down the events of this day in the book in the back of his head to remember! 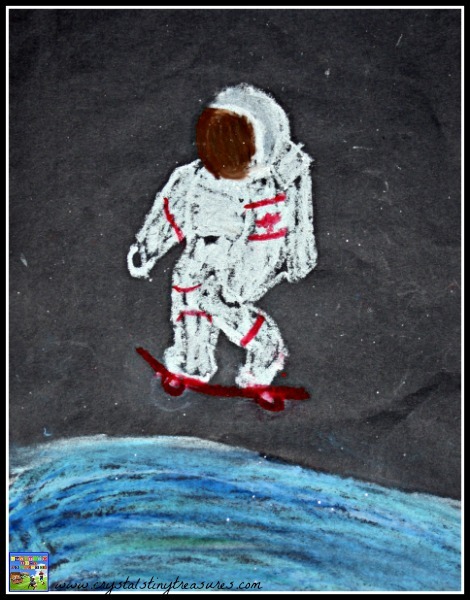 He’s also had a little help from his daddy to make an oil pastel drawing of Commander Hadfield. They chose to recreate the cover of his book, and I think they’ve done a fine job of it. After Tristan’s last picture selling in an art gallery, this picture is going to hand in his room-the frame is already waiting! Have your children met anyone famous? How have they preserved the memory? He is indeed an inspiration! 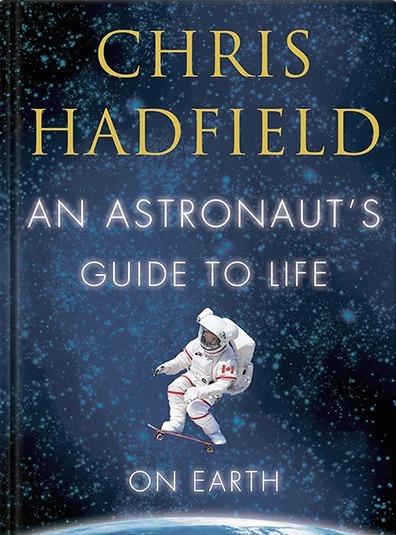 I can’t wait for next week when I should finish the book I’m trying to finish so that I can dive right in and learn more about Commander Hadfield in his book! I hope he heads out your way soon! Looks like a wonderful experience and one to remember! 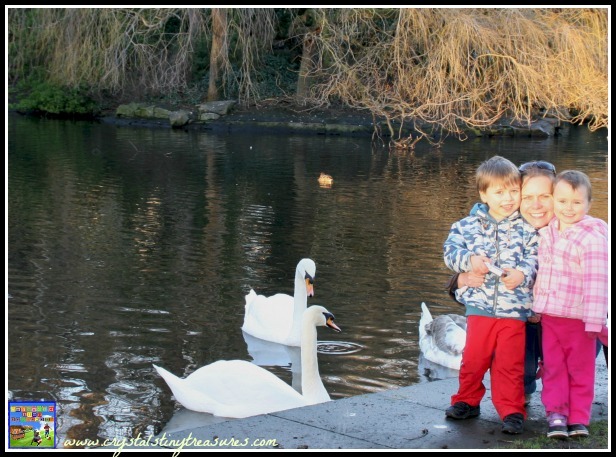 Thank you for linking up to the Small Victories Sunday linky. I have pinned this to our board. Have a great week and can’t wait to see what you link up next week!